Memories of escaping foggy San Francisco for the Marin Town and Country Club. 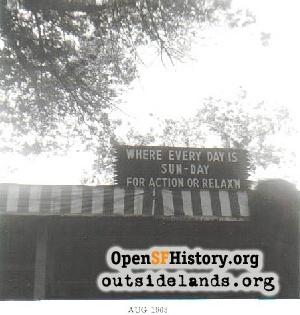 Now that we're nearing the end of summer, let's take a look back at what folks in the Outside Lands used to do and where they went to do it during summer vacations. 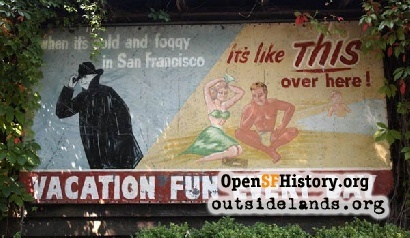 To many families, summer always meant spending time at the Russian River (a.k.a., the Irish Riviera). My grandparents, along with a group of their friends, were regulars at Johnson's Beach in Guerneville in the days before their 1910 marriage. Later, in the post-World War I era, they repeated those visits with their two boys. Old family pictures show my father and his brother with their straw-hatted parents floating down the river in a canoe named the "Dew Drop." Dad loved to tell the story of taking the ferry to Sausalito, then the train, either broad gauge or narrow gauge, depending on the destination, to Rio Nido, Monte Rio, or Guerneville throughout the 1920s. One of the few candid shots that I have of my grandfather shows him looking out the window of a passenger car on the Northwestern Pacific Railroad. Later, during his time at University of San Francisco in the mid-1930s, Dad and his brother, along with some of their school pals, used to make the drive to Yosemite in the summer and to Palm Springs (then a very remote and sparsely populated desert outpost) in the winter. Finally, in the last few years before World War II, my parents met each other for the first time at a dance at Siegler's in Lake County, and they spent time there with friends each summer until 1941 and again after their 1947 marriage. Probably because of such patterns, my parents' attitude toward all of these highly popular places in the years after I came along was "been there/done that." Hence, almost of my visits to those vacation spots came when I was with my friends and their families or else as an adult, since Mom & Dad invariably chose Marin Town and Country Club for almost all of our 1950s-1960s summer vacations. Our annual pilgrimage always began with Dad driving us up to Fairfax on the Lincoln's Birthday holiday in February for the sole purpose of selecting a cabin for our three-week stay in August. Mom was the real boss in this matter, and her choice depended heavily on the looks of the kitchen in the available units. Mom made it clear that she was not about to perform her culinary magic on any stove that was less than a full 30 inches wide, as she had to do during one summer in the mid-1950s when she was confronted with a model only 20 inches in width, containing an oven that would handle nothing larger than two Swanson TV dinners at one time. She also insisted that the refrigerator had to be big enough to hold a week's supply of cottage cheese, watermelon, lettuce, and popsicles—her summertime staples—and not an "apartment model" that would result in the need to go out grocery shopping every day. Once this matter was settled, and a cabin selected, our vacation plans were firmly in place, and we anxiously awaited the first week of August. Departure morning was always a Sunday, marked by going to church early, and then having breakfast at the Tennessee Grill on Taraval near 22nd Avenue. 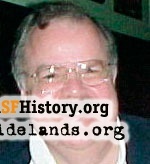 Dad had the car packed to bursting with luggage, kitchen supplies (Mom thought that the dishes, utensils, pots, and pans provided in the cabins were "unsanitary"), plus endless boxes containing bathroom essentials—did they think that there were no drugstores in Marin County selling Kleenex or Sea & Ski suntan lotion or Band-Aids? Leaving the fog behind, we caught the first glimpse of sun on the north side of the Waldo Tunnel, and vacation was underway. With seven swimming pools (some appropriately named "Diaper Bay" and "Small Fry Tiger Pit" to denote the age/skill level) spread across a 20-acre fenced area, access was controlled by tickets sold at the entrance. 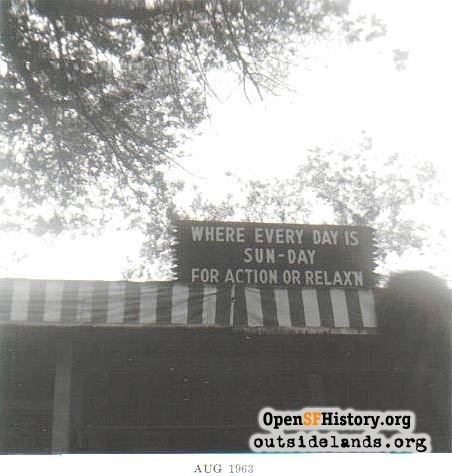 Exiting and returning to the paid area was accomplished with a daily-changing rubber stamp applied to the left hand of paid visitors—"MARIN," "SUNSHINE," "SWIMMING," and "PICNIC" are among the several evocative messages that still come to mind. Summertime meals were always easy for the tight-knit community of summer families (almost all from the Sunset District) who were occupying the cabins. Most of the Moms decreed that self-service cereal and milk were the only weekday breakfast offerings, while picnics were the order of the day for lunch. Each night, the air was heavy with the rich smell of charcoal as the vacationers in all the cabins surrounding the perimeter of the property prepared dinner. Throughout those days, I worked on developing my barbecue skills on a dark brown hooded charcoal grill with an electric rotisserie attachment. Like most pyromaniac-inclined pre-teens, I discovered that old cardboard milk cartons, stuffed with charcoal and paper towels, then subsequently doused with lighter fluid, made for an exceptionally fine fire. Throughout the day and the early evening, there was also a centrally located snack bar that dispensed snacks and rivers of Coca-Cola (plus Burgermeister beer for adults and the phony-card-carrying near-adults) in yellow and green waxed paper cups, while the blaring jukebox pounded out such hits as "Walk Right In, Sit Right Down." Sign above the snack bar at the Marin Town and Country Club, 1963 - Courtesy of Frank Dunnigan. Since television reception at the time was virtually zilch in that location, the management put on a variety of evening entertainment. This ranged from old 1950s films ("The Solid Gold Cadillac" with Judy Holliday and "The Bell Boy" with Jerry Lewis are two that come to mind, even today), along with low-stakes bingo, evening swimming, and outdoor ice cream sundaes. The old Redwood Bowl, a covered creekside dance pavilion on the property (eventually washed away in a series of winter storms in 1981-82), was largely unused by the late 1950s. Even so, it brought back many sentimental thoughts to those in the parental generation. More than once, as a family was walking in or out of the complex, someone would turn and point across to the site, and when I was about nine years old, I actually saw my own parents glance over in that direction, and then join hands and dance a few steps on our way to the parking lot. My dropped jaw was silent testimony to my youthful amazement that the old dinosaurs, then past 40 years old, would have even known about something as racy and risqué as dancing! At some point during our stay, Grandma would come up to visit, often with an aunt or uncle and some of our cousins. She would always bring along her incomparable chocolate chip cookies, raisin cupcakes, and a box of See's summer mix candy from one of her sisters, plus several fresh rolls of black and white film for picture taking. Tucked into her big straw tote bag would also be all the newspaper obituary sections from the weeks that we had been gone, so that the adults could discuss and stay current on what was going on back home. Like many grandmothers of the era, her few fashion concessions to the warm weather involved wearing a flowered muu-muu and a large straw sunhat, along with ankle stockings and sturdy-heeled white lace-up shoes. 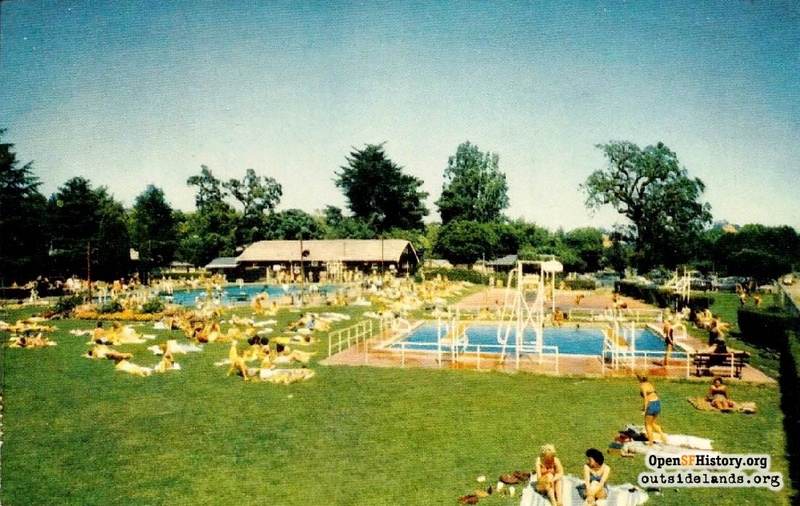 By the 1960s, the management had installed several large Jetson-like iron structures, shaped like gigantic sun umbrellas, throughout the huge expanse of lawn, in order to provide a welcome bit of shade from the blistering summer sun. There was also a stage with speakers, set up on a high platform, designed to blast the Top 40 hits of the day to those who had not thought to bring along their own transistor radios on Saturdays and Sundays. By the end of our second week, with the temperatures soaring into the 90s, most of the kids in the cabins surrounding ours had all grown restless with the sun and swim routine. One of the Moms, generally the owner of a station wagon, was invariably persuaded by several of the other parents to take a group of kids to an air conditioned theater (either the nearby Fairfax or else the Tamalpais in San Anselmo) for an afternoon double feature, usually involving John Wayne, the Three Stooges, or Donald Duck, depending on the predominant age group of the kids in tow. This was, indeed, a pleasant break for one and all, except possibly the adult driver of the vehicle. Slowly, but surely, the end of vacation would be in sight. The blazing heat of early August became a bit more subdued, with the evenings growing noticeably cooler, and dusk falling just a bit earlier each night. This would be our sign that summer was gradually coming to an end, though we enjoyed ourselves immensely, right up to that last dip in the pool on a warm Saturday evening the night before we were due to head for home. This was our standard vacation, year after year. Only twice did we ever alter the routine, and then it was to join the neighborhood crowd headed to Southern California for every family's 1960s visit to Disneyland and the adjacent must-see locations of Marineland and Knott's Berry Farm, but memories of that trip will have to wait for another column. Regardless of where we went, though, we always returned home to the fog of the Outside Lands by Labor Day, tired and sunburned, but recharged and ready for another year of school and work. Page launched 29 August 2011.